Last week two interesting things happened in the realm of copyright. First the owner of the copyright of a particular piece of Free software advised the world that he was withdrawing that software from the GPL; he instructed people to delete any copies they have and remove the code from any systems that might have incorporated it. I've wondered when we would see this particular event occur, since I recall the copyright laws being somewhat vague about this sort of thing. The problem is the owner of the copyright already gave people permission to use the source code under the terms of the GPL, which does not allow for revoking the license. The issue will need to be decided by a court which will determine whether a "gift" can be "ungiven". Some comments on Slashdot suggest that there may be something else at play here; such as a legal restriction which prevents the owner of the copyright from distributing the code under the GPL, and which would render the GPL invalid for this code. However the author did not indicate this and it remains to be seen what will happen. The other odd thing that happened was that a US judge found that a cease-and-desist letter is copyrightable. That means that if a lawyer wants to bully you into doing something, and you want to tell the world that you are being bullied, you are not allowed to post a copy of the cease and desist letter on your website. In theory this would mean that you're not even allowed to make photocopies of the letter to pass around to your staff (assuming you have staff). Frankly this is a frightening ruling. A cease and desist letter is clearly not a work of art, but rather a simple communication. The only effect that can be had from suppressing the publication of such a letter is that more lawyers will be able to bully people into getting in line with their clients' wishes. This is often what happens when someone's activities are embarrassing to a corporation. Suppressing this kind of speech can only have a chilling effect on freedom. The Star has an article about Oscar Pistorius, a runner who has two artificial legs. Mr. Pistorius has been barred from running in the Olympics because his artificial legs give him an advantage over normal runners. It seems an ironic, possibly unexpected situation, where a person born with no fibulas, who had his lower legs amputated at 11 months old, could have the advantage in a running competition. But the truth is the artificial legs were designed for only one purpose: running. They are not suited to any other task, and their structure is optimized for what they do. As a consequence they allow a runner to run more efficiently. It's unfortunate for Mr. Pistorius, who has trained hard and overcome obvious limitations in order to be a possible Olympic athlete, but if his prosthetics provide an advantage over normal legs then I have to agree with the ban. The Olympic games are supposed to be a narrowly-defined contest and things like steroids or prosthetics fall outside those limits. This is especially true of running, where almost no technology is used; compared to, say, skiing where the skis and poles are extremely advanced. One day there will be a sport where people can use artificial limbs, or maybe the poor availability of unmodified athletes will moot the discussion. Or maybe the normal runners can have shoes made that mimic the prosthetics. Until then, the disabled runner is just too good for normal runners. And that is possibly the highest compliment that can be paid to the runner and the people who made his running legs. 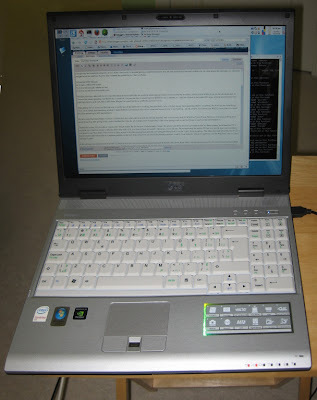 I bought my first notebook computer, an LG R500. Previously I'd resisted getting a notebook because they are very expensive compared to desktops; I'd rather spend the equivalent on a desktop and get twice the machine. But this time I needed the portability so I had no choice. C) It was on sale for a reasonable price. This last point may seem silly but it's important because most notebooks are woefully under-spec'ed when it comes to display resolution, unless you're willing to go for the ultra-high-end. In Toronto this means spending over $2000 for a notebook. I'm past the days of spending over $2000 for any computer, so I had few choices in the under $2k range. Almost all notebooks have pitiful resolutions, with only 900 or 800 lines. Maybe I'm a snob but those notebooks just don't cut it. After getting the LG home my first task was to verify that all the hardware is working, because there's only a 14-day money-back guarantee (there's a warranty, but that's not the same thing). Once I was certain that everything worked (I tested WiFi by connecting to the various unsecured access points in my building... tsk tsk, people, lock down your WiFi! ), it was time to re-install the OSes according to MY requirements. My most important requirement is Linux. Unfortunately this notebook came with the OS pre-installed, and more unfortunately it's Windows Vista (Home Premium). I've heard nothing good about Vista, bug after giving Vista a look I decided that I like the UI changes, even though they'll take some getting-used-to, and we'll have to see how the performance is. Thankfully for me, LG provides a "restore CD" which installs the OS for you. Unfortunately it erases the whole hard drive first (not a problem as this is a fresh system), but at least the CD is available out of the box (Some notebooks don't ship with a CD, you have to burn it yourself - ridiculous, if you ask me). More fortunately the restore CD lets you specify how many partitions you want to use. This means I won't have to mess around with disk-resizing tools and risk corrupting the file-system; it can be "right" from the get-go. The other downside about the rescue CD is that it installs some rescue files in a separate partition on the hard disk, which eats up one of the primary partitions. Luckily I can make-do with just 3 partitions: one for Windows, one for Linux, and one for data. In the old days my data partition was FAT-32 because that was the common-denominator between Windows and Linux. Back when I started messing around with Linux I even had to compile my own kernel because the kernel that came with RedHat 5.0 didn't support FAT-32. Ah, the olden days, when you had to compile the kernel... that takes me back. Anyway, more recently I stored all my data on a remote server, and thus didn't have to worry about the filesystem, because Samba took care of it. But with a notebook you can't rely on a network share and so your two OSes will need to play nicely together on the same disk. I will have to investigate the various NTFS drivers for Linux to see what I can do. It's been a while since I installed a Windows OS so I was interested to see what would be required for Vista on this notebook. It seems that LG has opted to provide a separate driver disk for installing the custom software that ships with this notebook. The basic installation when ok, no questions were asked (after setting up the partitions) other than simple date/time questions. After windows rebooted and appeared to be started, a program started that said "Setting to System Recovery Environment". The installer had originally told me to wait until user registration started, but it's still odd that we have to wait for this program to run, and odder that it starts up AFTER the windows welcome screen shows up. Once this mystery program finished it rebooted the computer. Then I was informed that Windows was checking my system performance, and then the system rebooted again. This was a pointless exercise since there were important drivers not yet installed, so my system's performance was 1.0. Booting seemed to take a long time and the system came up in 800x600 resolution. This is silly because Windows should know the monitor's resolution and I don't think it's too much to ask that windows know this is an LCD, and thus deduce that it should automatically use the highest resolution. At least the highest resolution was available without needing the nVidia driver installed. Once the system was up and running, I had a nice clean Vista install with zero third-party drivers. This is both good and bad. On one hand, it means I also don't have the third party demo software or other undesirable software that I might not want. On the other hand it means there are no drivers at all. I think it would have been more professional of LG to slipstream the drivers for the camera, video card, flash-memory accelerator, card reader, and all the other devices that are built-in. This is not what happens and instead you have to resort to the "LG Intelligent Update" CD that comes with the notebook. This CD lets you install all the missing stuff, in one fell-swoop. Unfortunately, the CD doesn't let you do a custom install, so I had to do that manually, but skipping the auto-run and running a bunch of setup utilities directly from the CD. This isn't very convenient but to LG's credit at least they make this possible. When I used to sell computers (mainly Compaq, AST (that dates me! ), HP, IBMs, and Packard-Bells) it was common for a "restore CD" to auto-install everything, including tons of junk you didn't want or need. LG's approach makes life relatively simple for the novice user but not hellish for the advanced user. Finally, some comments on Windows Vista. First, they've changed the Explorer address-bar/location drop-down box. This is good and bad. I like the bread-crumb navigation, which lets you quickly jump back up the folder tree. Some of the new behaviour is a little odd, though: when you click on the far-left bit of the address-bar it becomes a text input, but if you click on other places it navigates to what you clicked on. I'm not used to the behaviour and I don't know if a novice would like this or not. Then there's everyone's favourite feature, the authorization prompts. When you're a normal user it's handy that Windows lets you easily elevate your privileges to get work done, like installing software. For me, this is what I'm used-to from Linux and it's ok. But when I'm LOGGED-IN as the admin it's really, really annoying to be prompted every time I try to do anything admin-ish. I can appreciate Microsoft's predicament, and understand why they did this, but I wish they'd sacrificed more backwards compatibility in order to improve the user-experience for the new security. Oh well, they had to try something. 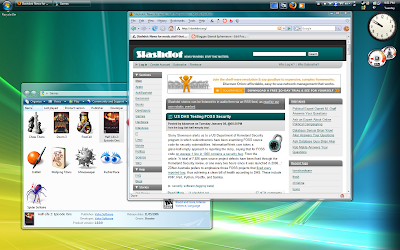 Linux has a disadvantage over Windows because LG took the time to support Windows but didn't do so for Linux (that I know of). Consequently there is no equivalent to the LG Intelligent Update disk which contains any third-party drivers, there is no one-stop install disk, and no guarantee that Linux will even work. But Linux usually works out-of-the-box on any modern system and I'd googled this system before so I was confident it should work. First I had to download Fedora 8 and burn it to a DVD. Then I put it into the drive and rebooted the notebook. The system booted right away from the DVD, but the DVD drive was noisy, like an old Commodore 64's floppy disk. Since I don't use the drive much that's not a big deal. I was greeted with the Linux install prompt, which asks me to choose between graphical and text-mode installation. Unfortunately, the graphical installer just hung the machine so I had to use the text-mode installer. I haven't had that kind of problem in years, and was quite disappointed. First impressions were not good. Things weren't better after the install was finished. I was left with a text-mode console, with no indication of what might be wrong with the graphical mode. Luckily I know my way around Linux so I was able to try starting graphical mode (it's called X, for you non-Linux users) by using the 'startx' command. This hung the machine... no wait! turns out it only hung the keyboard and display. I was able to ssh into this machine from my other computer and fix things. Amusing anecdote: years ago I told my manager about how I restarted X by telnetting into a crashed computer, thus fixing the computer. He said I'd been born in the wrong decade. Back on topic: since the console seemed to be the only thing broken when I started X, I hoped that installing the nVidia driver would fix my problems. I configured the livna repository and sure enough, installing the nVidia driver did fix everything. I even had a graphical boot screen, which was also missing earlier. The first order of business when installing a new OS is to get the patches. I did this in Windows using Windows Update and tried runing "Pup" to do the same in Linux. Pup told me there were hundreds of updates, and asked if I wanted to install them. I clicked yes and waited. That's when the Pup window went away and wouldn't come back. Well, it didn't go away, but it became blank and unresponsive. I ended up killing Pup and running the command-line tool, yum. Yum revealed (indirectly) what was wrong with Pup (besides an unresponsive GUI): the updates were 625 MB in size! This meant I was practically downloading the whole distribution again. Not fun, but at least I have high-speed internet. Once everything was up to date I had to get my hardware working. Almost everything worked out of the box except the WiFi, webcam, card reader, and fingerprint scanner. WiFi was actually easy to set up; for some reason the NetworkManager service wasn't running. As soon as that was on the rest worked fine. I don't know why it wasn't on, and I hate to think of what a non-expert would do to resolve this situation, but for me decades of computer nerdiness made this problem easy to solve. More tricky was the webcam. It is supported by the uvcvideo driver, which (for some reason) isn't part of the main Linux kernel and also isn't shipped in Fedora. So I had to install this driver manually, which I did according to the instructions here. With that driver installed the webcam works fine. I haven't installed the fingerprint reader driver in Linux (nor Windows) because I don't need it, but I should note that Fedora 8 appears to completely lack support for it. I didn't get the card reader working. It seems Texas Instruments hasn't released information about this device and it doesn't present itself as a standard block device; each memory stick type needs a custom driver. Work is under-way to reverse engineer this so I'll hold out some hope. Overall I am pretty happy with the notebook. There is one major problem, in my opinion, though: the keyboard is very odd. Now, notebook keyboards are notorious for having strange layouts and compromises, and this keyboard has its share of cramped keys. But the problem I'm referring to is the placement of the key with the pipe symbol and the backslash. 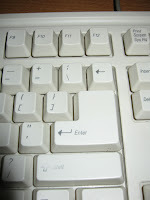 Most keyboards have this key on the second row between the back-space and the enter key. 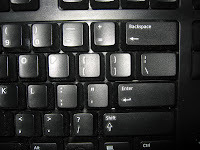 Some keyboards have a huge, backwards-L-shaped enter key, and they place the backslash beside the backspace key, and compromise by making backspace smaller. 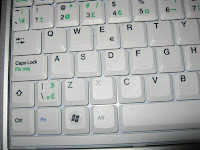 Back when keyboards didn't have Windows keys you might find backslash between control and alt. All of these make sense, and my favourite is the big, two-key-wide backspace and enter, with 1.5 wide backslash in the row between them. Why am I going on and on about this? Because the LG R500 does not follow any of these norms. It has the enter key as a weird upside-down L with the backslash key nestled-in between the apostrophe and the enter key. This means that the spot where I usually find the enter key (right next to the apostrophe) is now a backslash, and the spot where I usually find the backslash is now the enter key. To make it worse, there's a SPARE backslash key next to the shrunken left shift key, also in the spot where I'd normally hit the left-shift key. 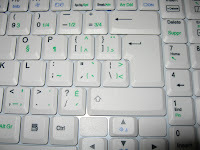 This means I have difficulty typing things because my shifted characters and newlines are littered with backslashes. I suppose I will get used to this but this is a major crime for people who touch-type. It'd be less irritating if the whole layout was different, say, Dvorak, because then EVERYTHING I typed would be wrong, instead of just my passwords (I end up typing a password as ******\) or my capital Ms (they become \m). Aside from the keyboard, my only other problem is the card reader. Besides its total lack of Linux support, It's placed underneath the keyboard and it's very tricky to reach. But at least it's there, and it accommodates my SD cards and Memory Sticks with no trouble, so that would save me from using my USB card reader, if it worked in Linux. The rest of the notebook is good: the keyboard feels nice, I can type most things perfectly, the touch-pad works well, and all the other features I've tried have worked exactly as you'd expect. Performance on this notebook is good but I've yet to play any games to really put it through its paces. The most important conclusion is that I will be keeping this notebook, and not exercising my 14-day money-back guarantee. As to which OS worked better; the Vista installation was definitely easier than Fedora 8, but if the installer had supported the video card out of the box I'd call it close. Fedora loses points on the lack of webcam support and the inexplicable failure to launch NetworkManager by default. I don't blame Fedora for the lack of card-reader support, however, because it's not their fault Texas Instruments are living in the wrong century with regards to supporting Free Software. Anyway, once installed the two OSes have behaved pretty much as you'd expect, and all is looking good.